The importance of continuous learning and clarifying your Why? The key question is: How will you choose to answer it? If you have not yet read Part 1: The Lab Rat That Survives Is The One Who Escapes Its Cage, available free to all readers, please click here to read it first. 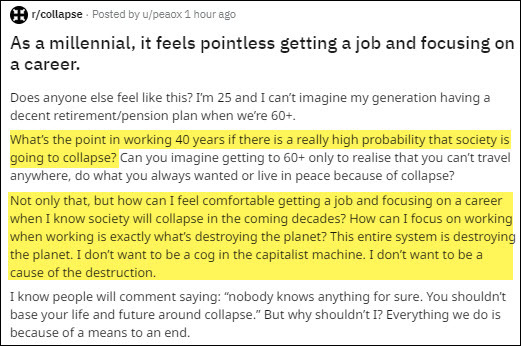 There’s a generational breakdown occurring with increasing numbers of young people -- let’s define them as the under-30 crowd -- falling into despair, dismay and even outright demoralization over the state of the world. Put bluntly, many of them see nothing to gain by preserving the status quo. Conversely, the over 50 crowd has already paid into the system and desperately wants to preserve the status quo. That’s where their retirement dreams exist. With their finger now on the brass ring, it’s simply unthinkable to ponder that it could slip out of their grasp. This demographic divide, between those with nothing to gain and those with everything to lose, grows wider every day. The very worst of it all is that the system into which the young are born ask them to perpetuate that same system by getting good grades, going into college student debt, and then working extra hard as tax donkeys and debt slaves for the rest of their lives. As the above Millennial pointed out, it’s working in those (often pointless) jobs that is destroying the planet. Might as well inject oneself daily with a cumulatively fatal poison. The promises of the generations before them ring hollow. The pension shave all been raided and hollowed out. Forced payments into Medicare and Social Security are never going to be returned in kind and are merely last-ditch payments to provide some measure of cover for the boomers relying on them. Embarrassingly poor infrastructure and massive piles of debt and underfunded liabilities are the true economic bequeathments of the prior generations to the next. For a disturbingly large number of olders (not elders) the answer is “Know about what?” because they are too deeply stuck in the current narrative to even notice the damage being done, let alone mount an intelligent, thoughtful response to it all. For the rest of us, we have to begin plotting our own path to breaking free from a self-destructive paradigm.